The 54 metre motor yacht Fortunate Sun has been listed for sale by Burgess. With exterior styling and interior design by Tim Heywood,Fortunate Sun was built in steel and aluminium by Australian yard Oceanfast and delivered in 2003 with a refit in 2013 and a repaint of the hull and superstructure in 2016. The interior features bird's eye maple and madrona burl panelling throughout, accommodating up to ten guests in five cabins. These consist of a full-beam master suite, two doubles and two twins, all with flatscreen televisions, high-speed internet access and marble en-suite bathroom facilities. 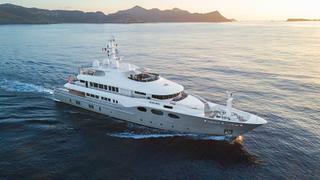 In addition, the four guest cabins can be converted into two VIP suites aboard this yacht for sale. The main-deck saloon offers comfortable seating, a bar and an entertainment centre featuring a large flatscreen television and a state-of-the-art audio/visual system, while forward is a formal dining area. Up in the skylounge is more relaxation space with large picture windows, comfortable settees, an entertainment centre and a bar. Doors from the skylounge lead out to the upper deck aft with a custom teak panelled table for al fresco cocktails and dining. Up a further flight of stairs is the sun deck with a Jacuzzi surrounded by fitted sun beds and a separate generous lounging area. Twin 2,330hp MTU 12V 4000 M70 diesel engines power her to a maximum speed of 17 knots and a range of 6,000 nautical miles at a cruising speed of 12 knots. On display at the Monaco Yacht Show 2017, Fortunate Sun is asking $24,500,000.